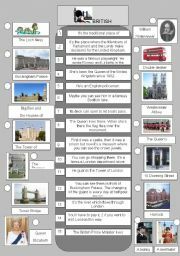 A reading comprehension/matching activity to make students learn essentiel facts about the most famous British landmarks. 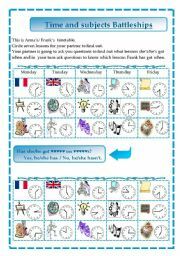 A school subjects and time pairwork activity to make pupils practise while having fun playing battleships. I must thank Jecika for letting me use her original layout of time battleships adapted to the needs of my class. 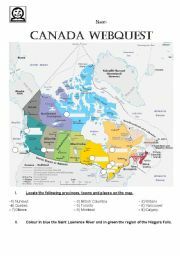 A webquest to enable pupils to learn some facts and figures about Canada, its geography, some sites and some facts about its history. Hoping your pupils will also enjoy it. 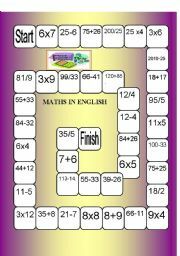 A boardgame to train pupils to say the numbers. Hope it helps. 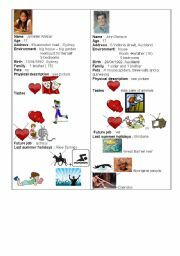 vocabulary activity where pupils fill in the appropriate vocabulary describing personality. A key is included. 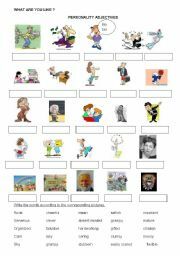 An activity which focuses on jobs and present simple using 29 different verbs to enrich pupils� vocabulary. 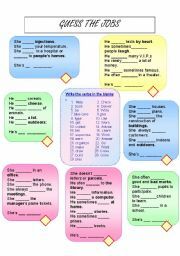 Some verbs are used several times; I created this activity before playing a job taboo to train the pupils. thanks to charmed one for the template. hope it helps ! introduce yourself speaking card. The third one of the set. I�ll only be allowed to upload the fourth one tomorrow. 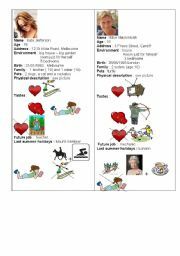 The last page of the set of cards uploaded yesterday. 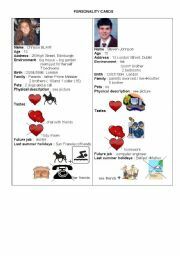 You can use it to make your pupils speak about the character in the third person singular or image they are the characters on the card and speak in the third person. 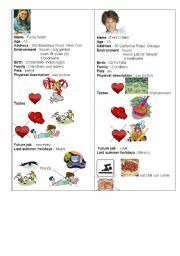 You can also use it as a role play in which girls ask boys questions about their character.